Prep work accomplished – You’ve already gone out into your yard and picked up anything that might be run over by your lawn mower that isn’t grass or weed related. You’ve dragged it out from that nice hidden place that you have for keeping it out of sight and out of mind – which was not really an easy task! It’s simple – you just want to cut the grass and put the lawn mower away and already you’ve started breaking into a sweat and you haven’t even turned the dang thing on yet! Now, I’ve both seen and personally experienced this next step. You’ve checked the oil and gas. You reach down and give it a pull. You guessed it. It won’t start! You pull the rope….it tries….you think it’s starting. You pull again…..There it goes ……. Chugging sounds of life………..hurray…………..uh-oh………not so much. It dies, as if it were ever REALLY running. Ok. You say that you don’t need to pull a cord anymore because you’re one of the lucky ones with an electric start button – so hopefully you remembered to put it on the charger the day before. I think it’s just as frustrating to go thru all of the above steps to find yourself standing in your front yard all geared up for the job at hand. Now picture this ….got the hat on, the grass cutting shoes, maybe ear buds cranked up. You got it covered. We’re going to get this thing done! Turn the key and it’s like your mp3 player just came to a slow halt as you hear the battery spin until it slowly dies. Now maybe you didn’t have to sweat like your neighbor pulling that cord, but you’re still stuck with a mower that won’t start. What do you do? The same thing as always……….pull it somewhere else (preferably in a shady spot) and start tinkering with it. For how long….who knows? That’s another post. these days. Things haven’t changed much over the years, as I found out in the following article. Basic information, but a nice refresher course. (ARA) – Keeping your lawn looking green and trim is hard work in itself. The last thing you want is to find out the engine on your lawn mower is not up to the challenge. Fortunately, with a few simple procedures you can keep your lawn mower or riding tractor running smoothly throughout the season and beyond. 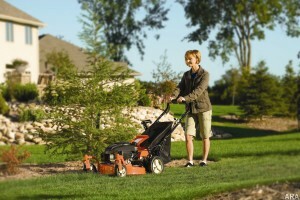 “Taking some small maintenance steps can help reduce the wear and tear on your lawn equipment’s engine so it runs great for a long time and you can spend more time enjoying your yard,” says Scott Mack, senior training specialist at Kohler Engines, a global manufacturer of small gasoline and diesel engines. * Clean out debris – When left sitting for a while, lawn mower engines may gather dust and dirt or worse, become home to a nesting mouse or other critters – a collection of grass and other dried plants is a key indicator of this. If you suspect an animal has been near the engine, check the engine for a nest or debris and inspect wires for chew marks. * Fully charge the battery – Batteries can lose their charge if left idle for more than a month. Certain batteries also require you to check water levels, in which case distilled water must be used in refilling. * Clean battery connections – Build-up and corrosion occur over time in the battery connections; therefore it’s important to clean them before corrosion causes permanent damage. Remove the wires from the battery and clean connections by scrubbing with a wire brush. Use a baking soda and water solution to neutralize the acid and clean the parts without causing any damage. Make sure that terminals are dry before reassembling the battery cables. Remember when removing and reattaching battery cables, the negative cable (-) should be removed first and reattached last. Also, ensure you properly torque the bolts. * Change oil and spark plugs – If you didn’t change the oil before your mower was stored a few months back, it’s important to do it now. Make sure you always use manufacturer-specified oil. Spark plugs are easy to replace and help keep equipment running in top condition during peak usage. Be careful when removing and reinstalling the plug not to cross-thread or over-tighten. * Filters: oil and air – An oil change is also a good time to consider replacing the oil filter, if equipped. While operating conditions can alter these intervals, an oil filter should be changed every 100 hours or every season, whichever comes first. Air filters come in a variety of types, such as foam, paper or dry element, with the type determining whether an air filter can be cleaned or must be replaced. At minimum, clean or replace the air filter seasonally, but refer to your engine owner’s manual to determine the air filter type and exact maintenance schedule. * Check for proper functioning – While the machine is off, check to make sure the moving parts operate smoothly. Check the throttle and the choke linkage. If there is a ticking noise when the engine has warmed up and is running at low idle speed, this may indicate the valves need adjustment. To help lawn mower owners identify and solve a wide variety of engine operational issues, Kohler Engines offers a series of small engine troubleshooting tips at kohlerengines.com. * Use the right fuel – It’s a good idea to buy fuel in small quantities because fuel varies for different seasons. If your mower is also used in the winter, it most likely will have a different fuel type than what is required during the warmer months. Keeping parts clean and using fresh fuel will make your engine run more efficiently. If your mower contains old gas from the last season that did not have a fuel stabilizer added, consult your local gas station on how to properly dispose of it and start with fresh gas. * Clean the carburetor – If the fuel wasn’t stabilized before storing your equipment, it’s possible that it gummed up the carburetor. Various additives can help address this problem. If an additive doesn’t work, you might need to disassemble the carburetor and clean as recommended by your user’s manual or service dealer. This requires considerable small engine knowledge, so it might be a good idea for most people to bring their lawn mower to a professional to be cleaned. Kohler Engines provides a series of small engine maintenance videos that will guide you on performing these simple maintenance operations. A list of maintenance tips, maintenance schedules and an online version of the owner’s manual are also provided at www.kohlerengines.com. We, at Gardening on a Dime, hope that you found a tip or two to help you keep your lawn mower running in top shape. No one should have to pull a cord until it feels like one arm is longer than the other or the shoulder has been dislocated. And certainly, no one should be all dressed up in the front yard in full working gear with no place to go. Daylilies, Lily of the Niles, Asiatic Lilies, Daisy Bushes, Caladiums?